It’s great to have a sparkling clean oven, but having a sparkling clean oven is more than just meets the eye. It has more benefits than just that… Dirty ovens can be real fire risks. I thought it was necessary to post this blog post since seeing warnings, and a few posters around Sheffield & Rotherham, as well as it highlighted on South Yorkshire Fire & Rescue website, and on the South Yorkshire Fire & Rescue facebook page highlighting how dirty ovens and grill pans cause lots of kitchen fires every year. According to a South Yorkshire Fire & Rescue survey, it found that that 40% of people admit to not cleaning out their oven or grill pan in the last six months. Watch Manager Gary Bruce of South Yorkshire Fire and Rescue Service, said: “You’d be amazed how many homes we go to where minimum standards of hygiene and cleanliness aren’t maintained, putting residents at a real risk of having a fire that could severely damage their property“. 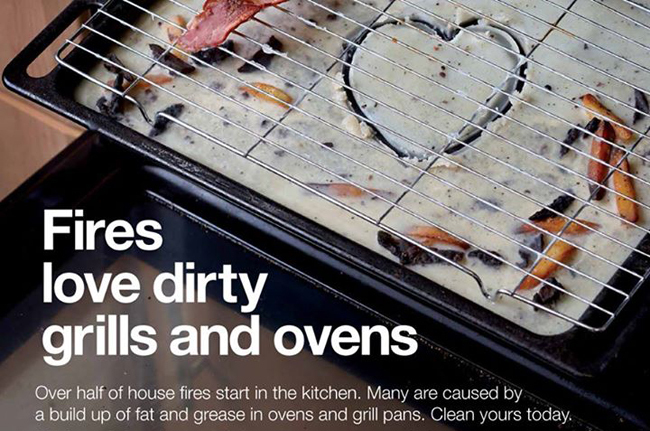 Advice being given to residents by South Yorkshire Fire & Rescue is to: Clean out ovens and grills regularly to avoid a build up of fat and grease. If your oven has got into a real mess, or you just want to stay on top of things, get in touch today for one of our deep cleans. We won’t judge you, we’ll put it right. You can find all the contact details on the contact us page of this website. Alternatively you can navigate back to our Home page and read further about our service.